Guns N' Roses bassist Duff McKagan showed an appetite for combustion by preparing for Download with a visit to a steam festival. The band were staying at Stapleford Park, near Melton Mowbray, where neighbouring Stapleford Miniature Railway was holding a steam weekend. McKagan bought a ticket for the miniature train but got caught up chatting with a fire crew. Thousands watched the band headline Download on Saturday evening. 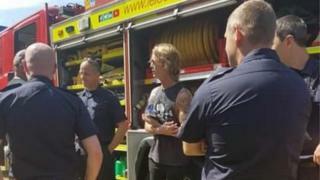 "It's a shame Duff [McKagan] didn't get the chance to ride on the miniature railway," said Nigel Spencer, from the group that operates the ride. Putting maybe a little too much perspective on the visit, Mr Spencer added: "He's obviously quite keen on fire engines too." Later on Saturday, a chartered helicopter took off from a site adjacent to the 10 1⁄4 inch gauge line with lead singer Axl Rose on board. The band were staying at the neighbouring luxury hotel while headlining the Download Festival at Donington Park. Big crowds watched the band's marathon three-hour-plus set on Saturday evening. As well as hits such as Paradise City and Welcome to the Jungle, they covered classics like Live and Let Die and Wichita Lineman. One rock fan named Deborah tweeted she had "never seen so many fans in one place".